Lobelia inflata, also known as Indian tobacco, wild tobacco, pukeweed, emetic weed, asthma weed and gag-root, is native to North America and can commonly be found growing wild over much of the United States. Lobelia derives its name from Matthias de Lobel, a sixteenth-century Flemish botanist. The erect stem reaches a height of between 6 in (15 cm) and several feet. The many small blue flowers appear in midsummer and are visible through late fall. The stem is hairy, and the plant contains a milk-like sap. Worldwide, there are more than 200 species of lobelia, growing predominantly in the temperate and tropical zones. Some species found at high elevations in mountainous areas of Asia and Africa may achieve a height of up to 15 ft (5.5 m). At the other end of the size spectrum, the dwarf lobelia (Lobelia erina) is sometimes cultivated as a small ornamental or hanging plant. This powerful plant has the distinction of being simultaneously a stimulant (for the respiratory system) and a general relaxant. This unusual combination may help account for the remarkably diverse assortment of ailments for which lobelia is used. To begin with, lobelia is commonly associated with the treatment of lung-related ailments such as asthma, bronchitis, coughs, pneumonia, colds and flu, and other upper-respiratory problems. Perhaps not surprisingly, then, this well-established medicinal plants has a special relationship with the (also long-established) practice of smoking. In some Native American cultures, lobelia was smoked as a treatment for lung diseases, which presumably led early European naturalists to dub the plant Indian tobacco. Considering the plant’s value as an overall tonic for the lungs, this practice stands in marked contrast to contemporary use of tobacco (which many Native American cultures also used) as a plant to be smoked. Even more intriguingly, lobelia is commonly used as an aid to stopping smoking, sometimes in combination with cramp bark. One of the alkaloids in lobelia, lobeline, has effects on humans similar to those of nicotine and can be helpful in treating the symptoms of nicotine withdrawal. These same properties may perhaps also explain the use of the plant to treat hangovers and alcoholism. Recent research, however, has questioned the usefulness of lobeline in smoking cessation programs; a German study published in 2000 concluded that lobeline “cannot be recommended” as a treatment for nicotine dependence. More recently, lobeline has attracted the attention of researchers as a possible treatment for methamphetamine addiction. Lobeline appears to oppose the action of dopamine, a brain chemical that regulates movement and emotion, and that is released by the effects of methamphetamine on the brain. Although reports published in 2001 and 2002 are promising, this use of lobeline has not yet reached the stage of clinical trials in humans. Some Native Americans also used red lobelia to treat both intestinal worms and syphilis. Among the Shoshone of the American West, lobelia tea was brewed and used for its emetic and cathartic properties. Lobelia is also commonly used as an emetic (i.e., to induce vomiting). This latter fact makes an interesting connection with the ancient “doctrine of signatures,” which holds that a plant’s appearance offers clues to its use: Lobelia inflata has been said to have “stomach-shaped” flowers. Although it can be effective alone, lobelia is also commonly used in conjunction with other herbs. Among these are coltsfoot, ephedra, grindelia, lungwort, and skullcap. 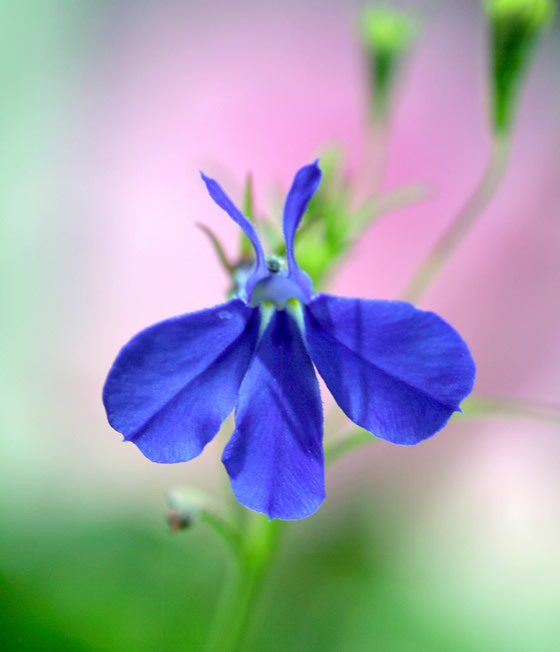 In homeopathy, lobelia is used in ways similar to its herbal applications: more specifically, in cases of severe nausea, vomiting, asthma, emphysema, and dry cough, and in the treatment of heart disease (angina pectoris and cardialgia). Externally, lobelia is used in connection with a variety of problems, including insect bites and poison ivy; bruises, sprains and arthritis; and ringworm. Lobelia is used both internally and externally, in various forms. The entire above-ground portion of the plant, including the seed pods, is harvested in late summer and fall, after it flowers. The leaves and seeds of the plant can be used to make a tincture. The dried herb can also be smoked or used as a tea. Prepared as a salve, it is appropriate for external use. All portions of the plant that are above ground are medicinally useful, including the stem. Lobelia’s chemical composition has been studied to a significant extent. It consists of various alkaloids (notably lobeline, as mentioned above), chelidonic acid, isolobeline, lobelic acid, lobeline, selenium and sulfur, among other substances. 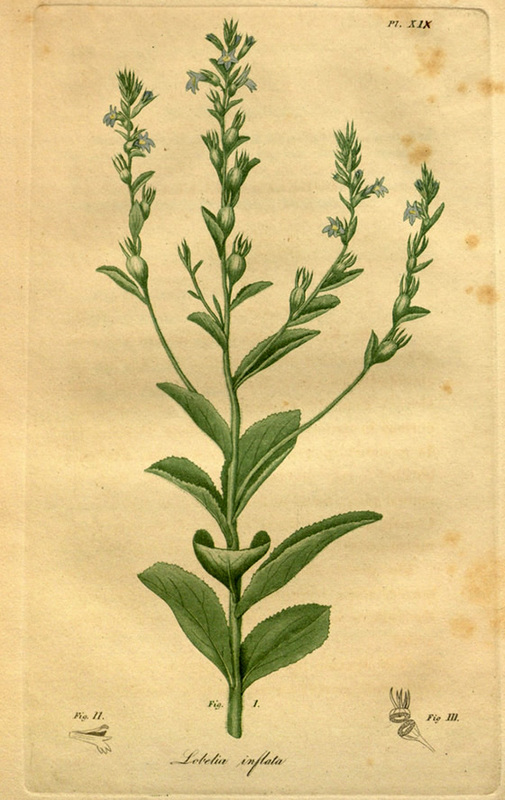 Perhaps because of the plant’s widespread and long-standing use for a diverse range of conditions, some of lobelia’s pharmacological qualities have been investigated in the laboratory, including its action on the lungs and the antidepressant effect of a component isolated from the leaves known as beta-amyrin palmitate. A 1996 Russian study of 196 species of medicinal plants identified lobelia as being exceptionally high in chromium content, making it potentially useful for treating a chromium deficiency in humans. The effects of lobelia are unusually dose-specific; in other words, this plant can have widely varying effects both in kind and intensity—depending on the amount taken. Herbal authorities differ markedly in their assessment of the plant’s overall safety; some consider it relatively harmless. As with any medicinal herb, users are advised to consult with qualified health-care professionals before attempting any form of self-treatment. People using any form of medication should make sure that all their caregivers are aware of any herbs they may also be taking. More specifically, women who are either pregnant or nursing should not take lobelia. The herb is contraindicated in cases of heart disease, pneumonia, shock, stomach ulcers, ulcerative colitis, esophageal reflux, diverticulitis, and high blood pressure. Reports of toxic effects of lobelia in children have led American pediatricians to warn people against giving the herb to children as a treatment for asthma. This warning is particularly urgent in areas of the Southwest where folk medicines containing lobelia are frequently used. Some writers also report that lobelia sap is highly toxic to livestock. In small doses, lobelia can have a soothing, sedative effect. In larger doses, it induces vomiting. The plant’s well-established use in connection with lung disorders is due, in part, to its expectorant effects. In potentially toxic doses, lobelia produces nausea, pronounced weakness, sweating, speeding heartbeat (tachycardia), sensory disturbances and diarrhea. In some people, even very small doses can cause nausea and vomiting. Signs of an overdose of lobelia include profuse sweating, low blood pressure, convulsions, respiratory depression, paralysis, coma, and death. Lobelia has been reported to have adverse interactions with several groups of drugs. It may potentiate (intensify) the effects of medications given to control blood pressure. It interferes with the action of drugs given to control diabetes. Lobelia increases the risk of loss of potassium from the body (hypokalemia) if it is taken together with diuretics or corticosteroids. 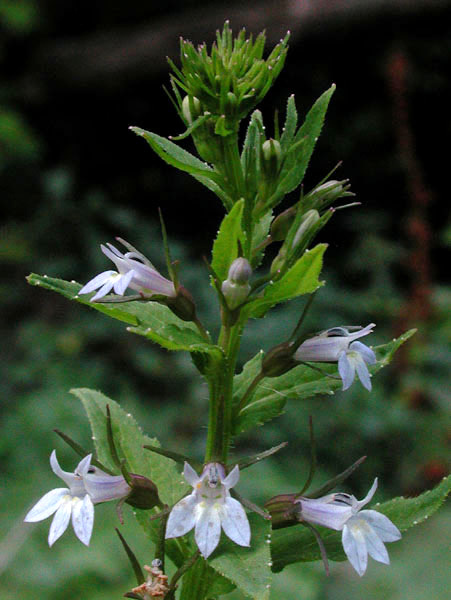 Aspirin and NSAIDs appear to increase the risk of toxic reactions to lobelia.